Hill’s Ideal Balance Kitten No Grain Cat Food is a complete grain free food developed to give your kitten a great start to life. This perfectly balanced diet is developed with natural ingredients to meet the needs of kitten before they turn one. With chicken as the main ingredient, this food helps supply lean protein to build and maintain muscle mass. The mix of vitamins and minerals from fruits and vegetables boost natural defences. Rich in potato, (which is naturally gluten free), to aid healthy digestion, reducing food sensitivities. 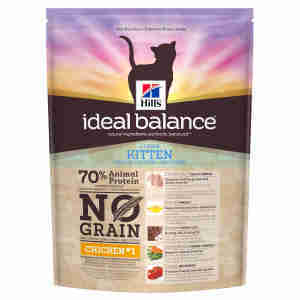 Hill’s Ideal Balance Kitten No Grain has everything your kitten needs to grow strong and healthy. digest, fish oil (1.3%), dried beet pulp, flaxseed (1%), dried carrots (0.5%), dried tomato pomace (0.2%), spinach powder, dried citrus pulp, dried grape pomace. Protein 35.4%, Fat content 20.3%, Omega-3 fatty acids 1.04%, Omega-6 fatty acids 3.5%, Crude fibre 2.1%, Crude ash 7.4%, Calcium1.3%, Phosphorus 0.99%, Sodium 0.47%, Potassium 0.88%,Magnesium0.10%; per kg: Vitamin E 850mg, Vitamin C 140mg, Beta-carotene 1.5mg. Vitamin A 45,869IU, Vitamin D3 2,414IU, E1 (Iron) 214mg, 3b202 (Iodine) 2.1mg, E4 (Copper) 27.1mg, E5 (Manganese) 9.4mg, 3b603 (Zinc) 182mg, E8 (Selenium) 0.4mg; with natural antioxidant.